Melissa Mortenson is a Utah-born girl who is happy to now call Kentucky her home. While sewing is her first love, she has passion for all things hand-made. She loves to create projects with her three kids in mind (daughter, 16, and boy / girl twins, 10). She loves the challenge of sewing for older kids. Most days Melissa can be found at home in her craft room working on projects for her blog, the Polkadot Chair. 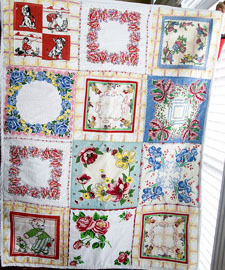 She was published for the first time in 2011 in Fresh Fabric Treats and has a pattern design company named Fourteen May. 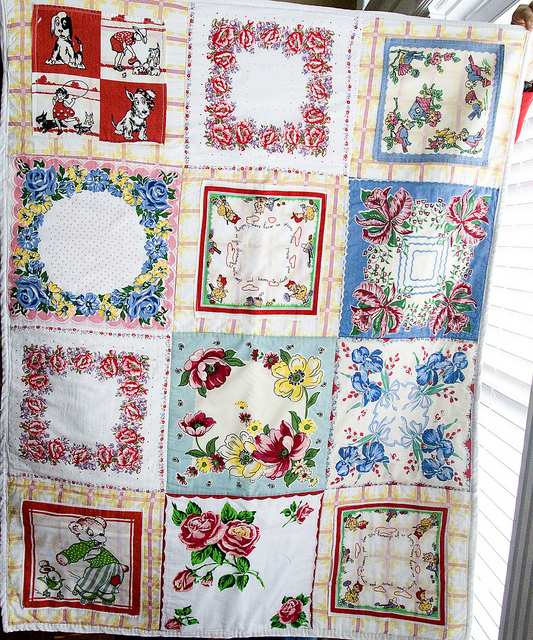 Melissa, inspired by a Martha Stewart project, made this vintage hankies quilt for her newborn niece out of a pile of old handkerchiefs she picked up at the Country Living fair. It's incredibly soft, entirely unique, and perfect for a little one to snuggle up in (especially since she backed it in super-soft chenille). Enjoy! Finished Size: 29" x 38"